Pace West's courteous, professional, and helpful staff is your entry point to start the healing process. Call us today, and we will guide you seamlessly to your first physical therapy appointment! Pace West Physical Therapy is located in suite 215 in the Crossroads Gardens building. Once parked in our covered parking garage, our suite is one floor up, accessible by stairs or elevator from the center of the parking garage. Turn left from the stairs or right from the elevator - our suite is on the east side of the building adjacent to the wooden gazebo. We are located on the east side of 30th St. (across from 29th St. Mall and the Colorado Athletic Club) between Canyon and Walnut. Our entrance (immediately north of the Jiffy lube) can be accessed traveling north or south on 30th St.
After passing through the stop light at Walnut St. you will proceed through a pedestrian crossing. Enter the left turn only lane immediately after the pedestrian crossing. Turn left and continue straight for 75 yards - passing Jiffy Lube and the Sussex building on your right - to the Crossroads Gardens building straight ahead. Look for the green and gold sign. Turn right (in front of the Crossroads Gardens building) and turn left into the visitor parking garage. Please note: parking outside the garage is reserved for the other building. The entrance to Crossroads Gardens is located in the center of the parking garage. Immediately get into right lane after turning north onto 30th St. from Arapahoe. Home Depot is on your left. On your right will be Sunrise Center (King Soopers strip mall), Best Buy, and then Jiffy Lube. After passing Jiffy Lube, make your first available right hand turn (Turn right in front of the Sussex One - 1790 / Crossroads Gardens - 1800 sign). Continue straight for 75 yards - passing the Sussex building on your right - to the Crossroads Gardens building (dead end). Turn right (in front of the Crossroads Gardens building) for 20 yards. Turn left into below building parking. Take Interstate 25 North to US-36 West (Westminster/Boulder). Be in the left lane to merge from Interstate 25 to US-36. Continue on US-36 for 21.1 miles. Turn right on Arapahoe Ave. US-36 becomes 28th street as you enter Boulder. As you enter Boulder you will pass: Table Mesa/S. Boulder Rd, Baseline Rd and Colorado Ave (1st traffic Signal) before coming to Arapahoe Ave (2nd traffic signal). Turn right (east) from 28th St. onto Arapahoe for 2/10 miles. Turn left (north) from Arapahoe onto 30th St. for 2/10 miles. 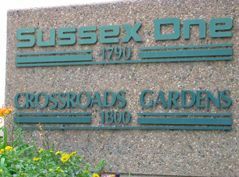 Turn right (east) in front of the Sussex One - 1790/ Crossroads Gardens - 1800 sign. Immediately get into the right lane after turning left onto 30th St. Home Depot is on your left. On your right will be Sunrise Center (King Soopers strip mall), Best Buy, and then Jiffy Lube. After passing Jiffy Lube make your first available right turn.